In the South, cold drinks are mandatory near the close of each work day…or maybe I should say just somewhere around 3 pm, when the day is at its hottest… and its humidest (and this is what humidity does to your brain in Alabama). This is featured in the new book The New Bloody Mary: More Than 75 Classics, Riffs & Contemporary Recipes for the Modern Bar. I had just driven through North Carolina, South Carolina and Georgia with my dad, where ripe peaches were everywhere. Earlier in the summer, I drank a fabulous tomato-hot pepper-peach-white wine cocktail at Palmina Winery and wanted more. I had just transported some beautiful cherry tomatoes grown in my friend’s garden from North Carolina. My personal Alabama chef had left me plenty of cilantro and lime, left over from his lovely grilled salmon dinner and his breakfast frittata (read about brunch in Alabama here). It was hot. And humid. And nearing the end of the day – ok it was afternoon and that’s good enough. 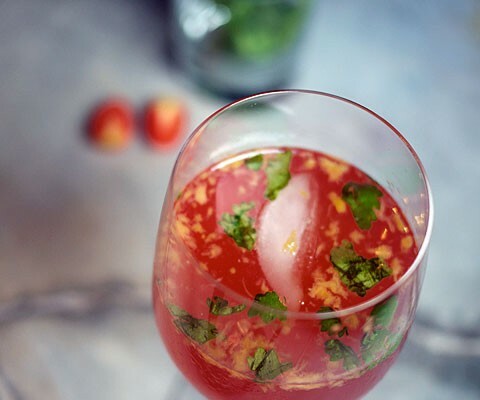 So, in the high heat and humidity of this Southern afternoon, I had the idea to mix fresh tomato juice, muddled peaches, lime, simple syrup, cilantro and Sauvignon Blanc into one good-lookin’ tall drink of wine. Or do I mean good-lookin’ tall drink of water? The wine or my chef? I forget now, it was so hot. Artisan cocktails with local ingredients had become popular all over the country, and I had recently tried a fabulous tomato-hot pepper-peach-white wine cocktail. I loved the idea of wine in the drink instead of spirits and I wanted more. That summer, I was visiting family and friends in the South, and had just driven through North Carolina, South Carolina and Georgia, where ripe peaches were everywhere. My friend also picked some very ripe, beautiful cherry tomatoes from her garden for me to take with me on the drive. It was hot. And humid. And nearing the end of the day – ok it was afternoon and that’s good enough. So I set to work on this drink. Muddle the cilantro, tomatoes, peach and lime juice together with all the juices and sugar. Pour this mixture through a large strainer into 2 large wine glasses—you want some of the fruit material to go in the glass, but not all the seeds and large skin pieces. Top with cold Sauvignon Blanc and stir. Add ice and extra chopped cilantro. Note: You can also add sparkling water or soda to make a bubbly drink. Whichever version or combination you choose to create (get more ideas here), it’s sure to cure all your ills. But it certainly won’t help your grammar. Looks refreshing and good, i love peach so this will be a killer drink to me. feel free to visit my site for a free giveaway this week. This sounds good. Could you drive after having six of these drinks?